I finished up my Mother's Dream patchwork cushion today! yay I'm so happy with how it turned out. It was a dream to put together, and I'm pleased that all went smoothly; even the binding! Love it when this happens! Above is a corner of our living room :) do you like my new CK curtains!? I would show you more but it's so bare! - which is why I'm trying to decorate the place with handmade goodness. I pulled fabrics based on the colours I thought would work nicely with them, although now I've made it I think the curtains look alot more pink than green? so I think I'll make another one with more pinky tones next time. I finished off the pillow a couple of days ago but added the binding today as it needed a little something extra, I think the stripes really pop against the cream cotton. Definately my favourite out of my other handmade patchwork cushions. You can find the tutorial for it here. Have you been working on anything fun recently? It goes perfectly in the corner! Love the striped binding. It looks great. You did an amazing job! The cushions gorgeous and your curtains are lush!! The striped binding is one of the loveliest things I've seen in ages! It is so beautiful! I love how vintagy it looks, well done Jessie!! Very nice corner,curtains and cushion.But love the color of sofa too! 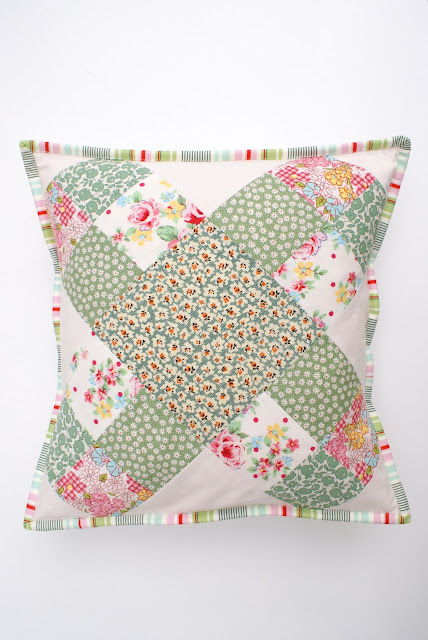 That cushion is so gorgeous, I can't tell you how much I love it! 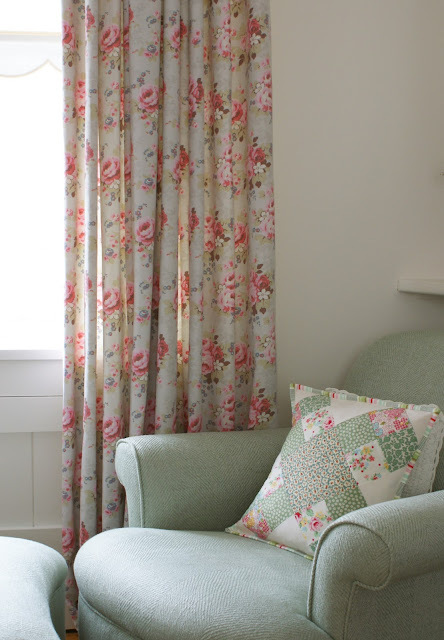 What a beautiful corner it makes with those curtains too - stunning!! what a pretty pillow!! LOVE it!! Both curtains and cushions are making a great combination .Colors are very elegant making room classy.Loved it.